This week saw Romford Towner firsts in all areas this week in a convincing win that rattled the backs of nets over 20 times during the game. 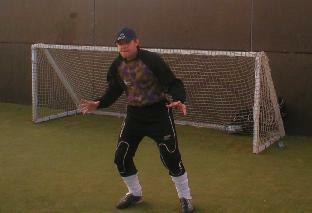 Most importantly, attacking midfielding hitman Roger Dogs gave way to another kind of fury this week as he channeled the frustration of hitting posts, wide shots and saved digs into one glorious shot which left the Cranham keeper stunned. This was also the first week in Romford Town history that the goal count has been into double figures at 14. Tonight was also the night that Towners (after much deliberation) finalised the contracted deal to sign Peter Clayton as the official Romford Town mascot. Dediction to the club shone through as Pete wore a London Underground reflecter vest during the whole game on the sidelines. I've asked myself time and time again but I can't work it out. Why am I single? Mainly a good night for the Towners, if not a little lacklustre, with each Cranham goal, Romford always had a reply. A dominating first half found John McGhee following in last weeks trend as he continued to pop shots off from all over the place. Finding the net on two occasions McGhee was unlucky to get the hatrick. With his second appearance for the club, shot-showman Stevie Hammond pinged rockets and placed shots in to score more goals than any other Towner on the night. Although more should have been on the cards, Hammond was unlucky to provide the Romford Town 'goals for' stat higher up the numbers ladder. And who can forget, (we all know it deserves another mention) the wondergoal that was placed with exquisite speed and accuracy in the top right hand corner of the Cranham goal. Roger dogs delighted fans and fellow players alike on a night where a Roger Westwood goal brought with it the promised Romford Town victory. With Dan Monteith on shooting form too, Romford were making easy work of Cranham Leisure. At times there was some lovely link-up play that all Romford players got involved in as the balls was effortlessly spread across the pitch just outside the Cranham area on several occasions, usually resulting in more goals for the reds. 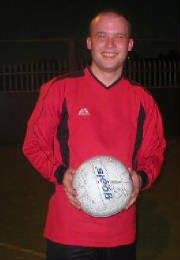 Monteith stepped up to slap in a controversial 4 goals which watched him climb the Top Goalscorers ladder. With the taste in his mouth lets hope he's hungry for more. The only person not to get on the scoresheet tonight was the one we call 'THE ROCK'. That's not to say he didn't have his chances. Benny returned to form this week with important tackles and unlucky goalmouth opportunities, several of his shots saved well by the opposition keeper. With the match ending 14-9 to the good, the Towners now look forward to the derby of the season against The Shamoans. Currently sitting in 6th, the teams position in the league does not justify the half-decent team. They keep us running and working and Hammond has been looking forward to this game since we last played them on Hammonds debut earlier this season. Next week, replacements will be called as Roger Westwood is unavailable as is DMK and John McGhee. "Wait! My spidy-sense is tingling!" 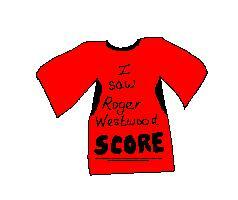 Roger Westwood - We all know why and I think we all know it was a goal to remember. Every person affiliated in any way with Romford Town has been waiting for that goal to come for ages now. Sure, Hammond had a good game and scored the most goals, sure DMK did better whis week to stick a few away and yeah Murrell is the best player every week, but Rog is my man of the match for the profound effect of scoring his wondergoal, well done fella. Chris Jones - Just fell to bits from the off. Ha ha, to be fair they could've got a lot more and although he wasn't on form (role it to OUR players Jones) he still pulled off a few wicked saves. The opposition had a good shot (how many of their shots went over?) and Jones stopped some nice pops. Looking forward to seeing him outfield where he belongs next week. John McGhee - Had a good game, with some hard tackles and half-decent shots in the middle of the park. Of course, popped those 2 in to extend on the first ever Romford Town goal. DMK - Wicked game tonight. Dunno how many goals he really scored and we'll probably never know but who cares he did well anyway! A nice performance with all the sweet footwork, decent passing and goals you could want. Ben Brace - Some unlucky chances to extend his goal count but was mainly there as the iron fist of the team. 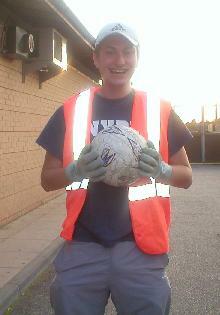 Cracking into tackles and teaching the opposition a thing or two about silky skills. Rickee Murrell - Scored the shittest goal in Romford Town history but came close on a couple of occasions. Still as well-endowed as last week.